Earlier this summer, Canada Post honored Stella — the title character of a series of picture books by author Marie-Louise Gay — with a series of stamps. It’s the second stamp from Canada Post to feature an image from children’s literature, and it got me thinking about other countries around the world who have featured kid lit in their postage. Here’s a round up of some of the coolest postal tributes to kid lit from around the world. I’ve stuck to the stamps based on the books themselves, rather than the stamps that pay tribute to the books via their movie or television adaptations. In honor of World Oceans Day in 2008, the United Nations Postal Administration (UNPA) produced three series of stamps honoring Dr. Seuss. The above are the US $.46 stamps, but there were separate issues and designs, including one for the Euro and one in French. The UNPA wasn’t the first in honoring Theodore Geisel’s work on a stamp, though. The United States Postal Service (USPS) issued stamps honoring him and his work as well. In 1999, there was the stamp honoring The Cat in the Hat. In 2004, the USPS honored Geisel and all of his creations, including the Cat in the Hat and The Grinch, in this stamp. Check out the holes — they’re really what make this stamp a great dedication to the story. Another classic which has seen a variety of tributes in stamp form world-wide is Lewis Carroll’s Alice in Wonderland. This 1979 stamp from the UK is one of the most memorable stamps, but it’s certainly not the only one. The Comoros Islands developed this trippy stamp for Alice in 1976. The Republic of Burundi honored Alice in this image of the Mad Hatter’s tea party in 1977. To celebrate the 150th anniversary of Lewis Carroll’s Alice in Wonderland, in 1982, Mali created an entire series of stamps with the classic cast of characters. A. A. Milne’s Winnie the Pooh has been the face of many stamps around the world through the years as well. In 2010, Great Britain released another series of stamps dedicated to Milne’s Winnie the Pooh. Above is Christopher Robbin with Pooh and Piglet. You can view the entire series here. Canada treats Winnie with his cast of friends to this stamp with a small collection in 1996. The entire vivid series can be seen here (some of them are based on the cartoon series, but not all of them). Guinea released a stamp featuring Winnie the Pooh and Piglet in 1998. Antoine de Saint-Exupery’s The Little Prince has made a mark on stamps around the world, as well. In many of the tributes, Saint-Exupery is really the star for his work with and about flight. In 1995, Argentina featured The Little Prince and Saint-Exuprey himself on their mail. The Little Prince secured a spot on Bulgarian stamps in 2000, along with his creator. Here’s Croatia’s take on The Little Prince in stamp form from 1994. Of course, France developed an entire series of stamps honoring The Little Prince in 1998. Choosing to go with a look that differs from the traditional illustration is Guinea’s stamp for The Little Prince, issued in 2008. Poland offers up this interpretation of The Little Prince for a stamp in 2005. Great Britain released a series of stamps in honor of their own Harry Potter that featured the book covers from all seven volumes of the series in 2007. The Bahamas showcase Hans Christian Andersen’s classic Thumbelina in 2005, in celebration of the anniversary of his birth. Brazil honors another of Andersen’s stories, The Ugly Ducking, in 2005. Another 2005 stamp issued in honor of Andersen was this one in the Falkland Islands, a tribute to The Little Mermaid. This one not only features the story, but it shows an adult sharing the story with an eager group of young listeners. St. Kitt’s honored Andersen’s birth anniversary with their stamp featuring an image in honor of The Emperor’s New Clothes. 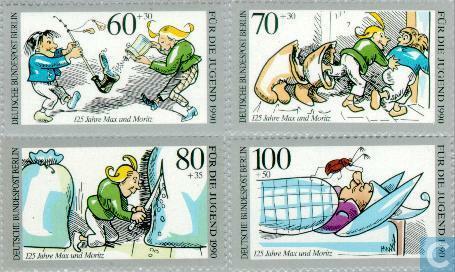 Berlin created a series of stamps honoring the 125th anniversary of Max and Moritz, an illustrated German story for children. Others in the series can be seen here. Gibraltar released stamps featuring Roald Dahl’s characters in 2010, including this one of Matilda. Full series here. Liberia’s children’s literature stamps in 1998 included this tribute to Beatrix Potter’s Peter Rabbit. The entire series can be seen here. Astrid Lindgren’s Pippi Longstocking gets this colorful tribute in a 2009 Macedonian stamp. Naturally, Sweden pays tribute to Pippi, as well. This is from a 1969 release. Here, the same image is carried on in Sweden’s 1987 stamp dedicated to Pippi, but this time it’s a bit more colorful. The horse looks bigger here, but Pippi also looks a bit stronger. Paraguay honors Charles Perrault’s Puss in Boots with an entire series of colorful stamps in 1982. Full set here. Johanna Spyri’s Heidi gets a place in philatelic history with this Swiss stamp, issued in 1984 in a series that also honored Pippi Longstocking, Max and Moritz, and Pinocchio. This is only a small look at the wealth of stamps around the world that feature children’s lit. Many of the images above come from the catalog at the Philatelia website, and it’s worth perusing this amazing collection, which has an entire category for children’s lit. Although not as robust in information, for those who want to peruse stamps in honor of a wider variety of literature — children’s and adult alike — will want to spend time with the collection pulled together at Literary Stamps. And if you’re interested in wearing stamps that feature literature, have I got the Etsy shop for you.